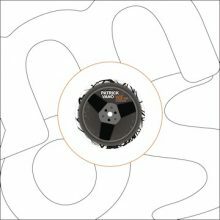 The „Tape Jam EP“ is Patrick Vano’s fourth release on Berlin-based label Mo’s Ferry. The A side „Rhythm Disease“ crackles and rumbles in this typical sound Mo’s Ferry is known & loved for. „Drone Shadows“ on the flip plays the Techno bow in wide and flowing moves – best suitable for the later party hours. With the bonus track „Controlled Curves“ Patrick Vano returns to the dance floor – even more focused and driven with its sawing trademark lead bass.